Dubai, UAE, March 25, 2019: We are all victims of excess hair fall. The effects of harsh climates and chlorinated water on hair are well known to those especially living in the Middle East region. We use desalinated water for everything, including washing our hair. However, the downside of this is that minerals from desalinated water cause hair breakage but that's not all. The adverse effects of desalinated water on hair and scalp in this region include but are not limited to dandruff, hair-loss, and a significant calcium build-up on the surface of the scalp that hinders or stints new hair-growth. One of the best ways to combat this problem is by using reliable solutions that negate the harmful effects of excess minerals that get attached easily to hair. Launched this year in the UAE, Vierro presents itself as the optimal solution to hair fall due to the effects of desalinated water. Vierro is the result of the most brilliant minds in haircare coming together for the same goal – delivering beautiful hair, perfected by science. 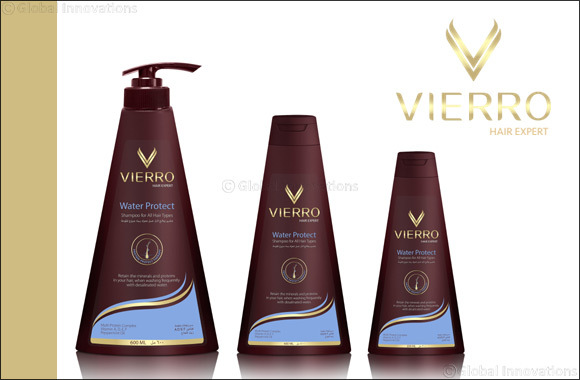 Unlike any other brand, Vierro's Water Protect and Weather Protect shampoo and conditioner ranges are specially designed taking into consideration the climatic conditions of the Middle East. A careful mix of oils and proteins protect your hair from buildup due to dust, humidity and desalinated water. They also help retain the necessary minerals and proteins in your hair that are usually lost when washing frequently with desalinated water. Vierro's hair experts have crafted a combination of the most unique proteins providing your hair with the best nourishment science has to offer. Its Protein Protect Therapy is a newly designed technology that strengthens and protects hair from root to tip. It nourishes the scalp with a coated layer of proteins which promote hair growth. A unique blend of rich natural oils and minerals create a therapeutic hydration experience, leaving hair strong, healthy and shiny. The Vierro Water Protect range currently includes a Shampoo & Conditioner duo for all hair types. It aids in retaining the minerals and proteins in your hair, when washing frequently with desalinated water. Featuring a multi-protein complex, infused with Vitamins A, D, E and F and Peppermint Oil, this hair duo will leave your hair protected, nourished and divinely scented. Giving your hair its daily dose of Vitamins A, D, E and F makes hair smoother from the root to the tip when combined with proteins. The fresh smell and tingly sensation offered by Peppermint Oil makes it a favorite but it also offers so much more. Peppermint Oil cools the scalp and eliminates dandruff. It aids in increasing circulation, improving hair growth and preventing hair loss. Vierro products are available at all Carrefour hypermarkets in the UAE.